You might like this game if you like Tamagotchi type games. 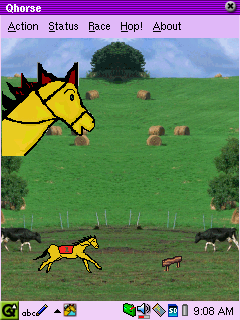 Qhorse is a game where you raise and train a racing horse. Using several action commands the horse can be fed or trained to increase its attributes, like power or muscle strength. 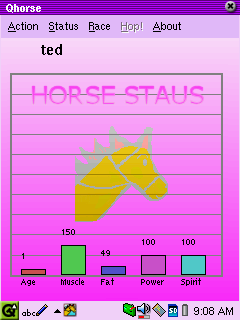 Once the horse is fit it can be sent on a racing track to fight against the computer or a network player. Qhorse is a very nice idea for a game. Training a computer animal revives the catching Tamagotchi idea and training a computer horse is indeed fun. Especially, if the carefully trained horse can go on a racing track. Unfortunately, this very nice idea is accompanied by a lot of drawbacks which make this game much less fun as it could have been. First, the graphics is very simple and the scrolling of the background in the movements scences is awkward. Second, the game is very slow paced it lacks some exiting options, like more horses, betting on the race outcome, scores, statistics or highscores. Also the options are few and their effect limited. It can be recommended to have a look at this game for its nice idea. However, it is unlikely that you play it for a long time. But maybe there are some updates of this promising game in the future.